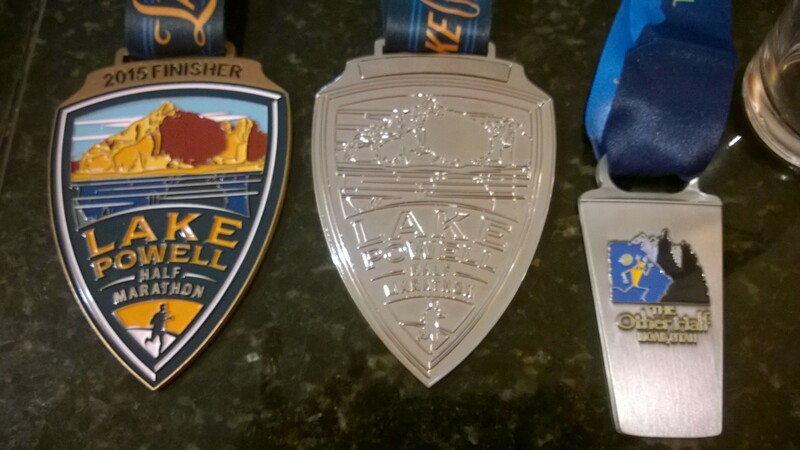 This is my collection of medals, including my first and only medal for a 5K from the Gasparilla Challenge in Tampa, FL. Not sure exactly where my AG awards are; probably in a box in the garage. I’m sure they’ll show up eventually. Boston. Chicago. New York City. 3 of the 6 Abbott World Majors. Cherished memories of a phenomenal year. I’ve got one more half marathon on the calendar this year, Mount Dora here in Florida. 2017 will be the year to knock out more states! I think you should see this photo first, of our gorgeous new kitchen, since the last image I posted was the “before” of this same space. What a difference! I must give credit to Marty for selecting the perfect back splash. We took a few of the Christmas tree ornaments to make the centerpiece, affectionately called the “Bird Ball Bowl”. It’s not far from the dining room to the living room (or any room, for that matter!). We swiped a few more shiny balls for this bowl. My niece, Alexandra, sent us some “Joy”! I’m happy that some of my angels were in the boxes we brought. …and an impish Clemson elf! It’s been a little over a month since we started our renovation project so I thought it was time for a little update. My initial thought was to remove those upper cabinets over the island and open the kitchen up into the living/ dining room, as well as add all new flooring. Since we decided to get new cabinets, we realized that we could reconfigure the island and really make the most of the space. The new island is going to be 10 feet long! New tile flooring goes in next week and the cabinets come in early June. The lights are on order and the entire house is getting a fresh coat of paint. I cannot wait to see how it all comes together! On Day 4 of Retirement, Marty and I drove down to Florida so he could finally see the house I bought. Our cute little beachside bungalow only needed cosmetic updates, or so I thought. But the more we got into it, the more we decided to do. Stay tuned to “The Next 50” to watch our progress as we tackle our first fixer upper. It should be fun! Marty has quickly transitioned from executive to laborer! Marty has been retired exactly 12 days. 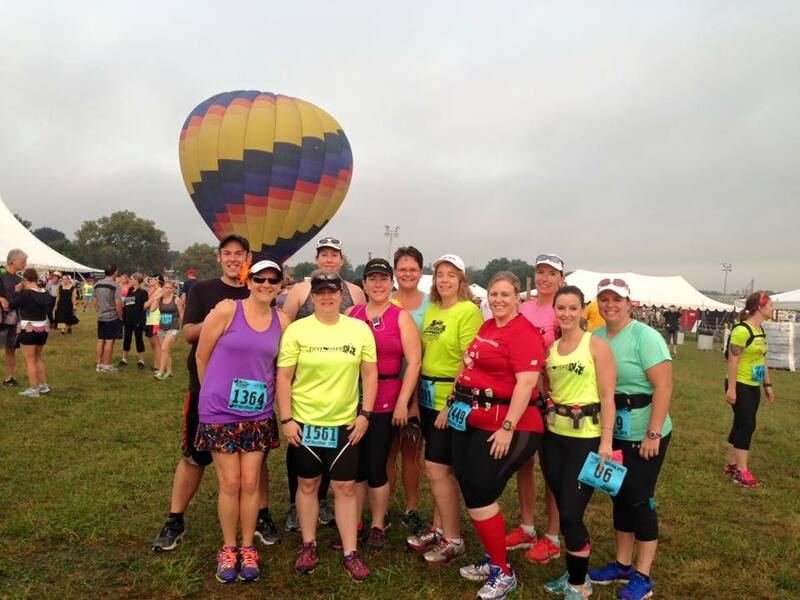 Not being ones to sit around and twiddle our thumbs, we kicked off retirement on April 1 first by driving to Lexington, KY and running a fun race called Run the Bluegrass. I ran the 13.1 race (for the 3rd year in a row!) and Marty ran the 7 Miler. We met up with some old friends, made some new ones and feel accomplished for conquering the hills of Lexington! RTB provided a tent for our our club, with water, bananas, and chocolate bourbon donuts! Perfect day for a hilly run! I am really not very good at this blogging thing. I see it’s been 5 months since I last posted anything. Bad me. I have been steadily running races (7 half marathons so far in 2016!) and clicking off states and realized that I reached a milestone of sorts this past weekend. With the running of the United Airlines NYC Half Marathon I have now officially run in 25 states. I am halfway there!! Here’s a look at my current map, with blue being the states I’ve run half marathons in, red is where I’ve run full marathons (disclosure: I’ve run half marathons in VA, NC, and SC too) and the green states are the new ones I’m signed up to run in (so far) this year. This past weekend was a “milestone” race, being in my 25th state, and it was pretty special, so I thought it deserved a mention. Entry into the United NYC half marathon is by lottery, so I was pleased but surprised that I even got into this race. I joined over 20,000 runners in Central Park for the 13.1 mile run through Manhattan. What an experience! The first half of the race wound through the park, then we exited onto Broadway and ran through Times Square before turning onto 42nd St. We then headed south along the Hudson River toward Battery Park and the Finish Line. 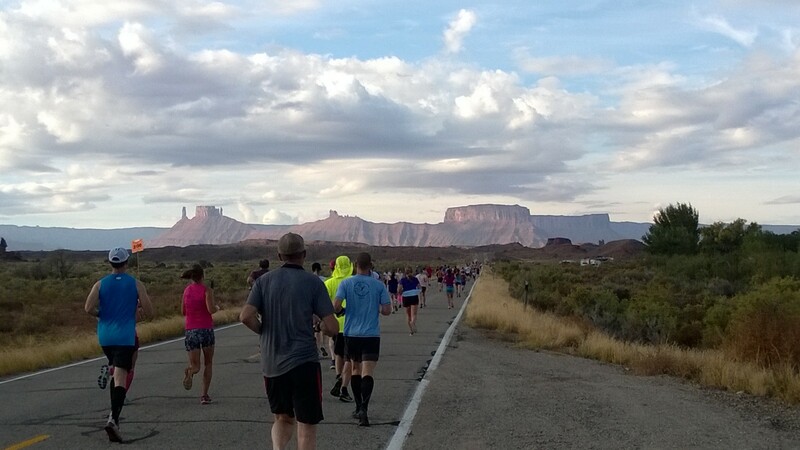 Mid October is a popular time for half marathons. 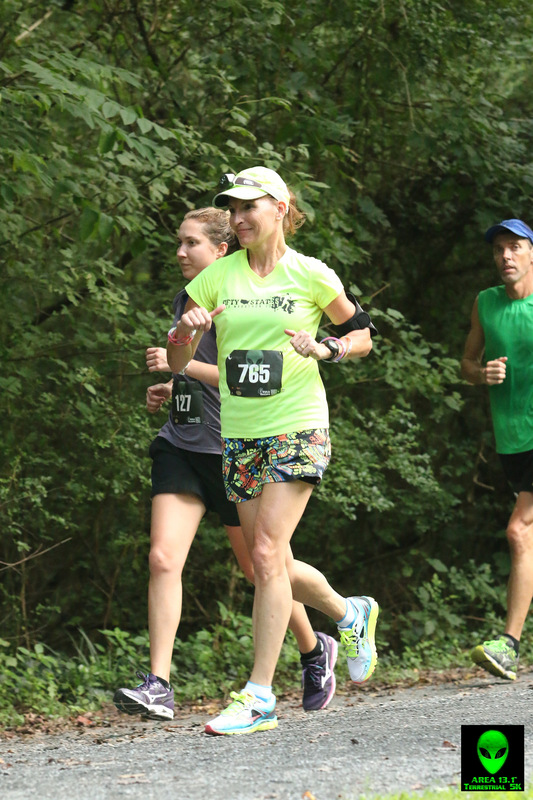 I counted over 30 on the calendar for this past weekend, so how is a runner to choose? I picked one of my favorite locations and was not disappointed. 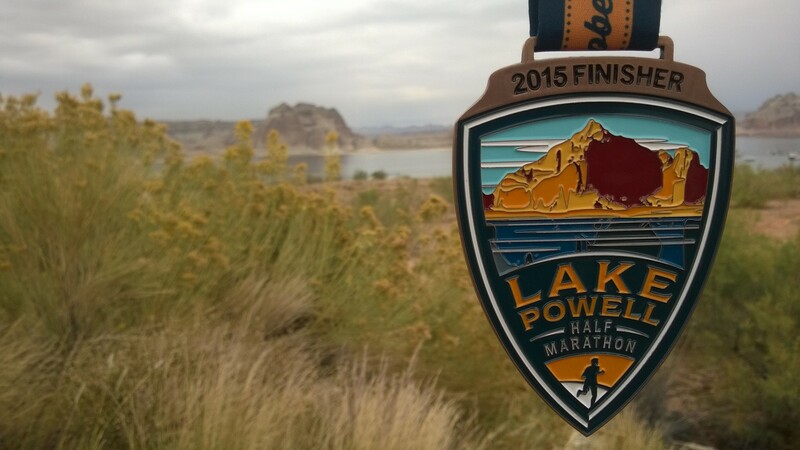 Sat., Oct. 17- Lake Powell half marathon in Page, AZ. 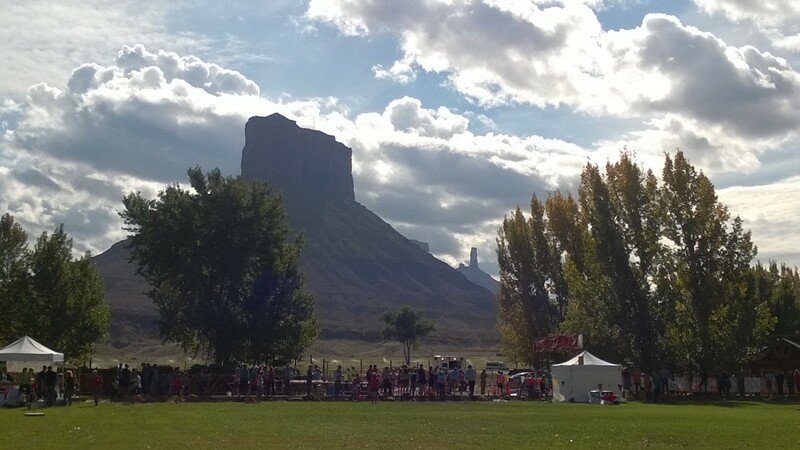 This race is put on by Vacation Races, a series of half marathons in, or at least near, national parks. I was very impressed with the organization and the course was stunning! 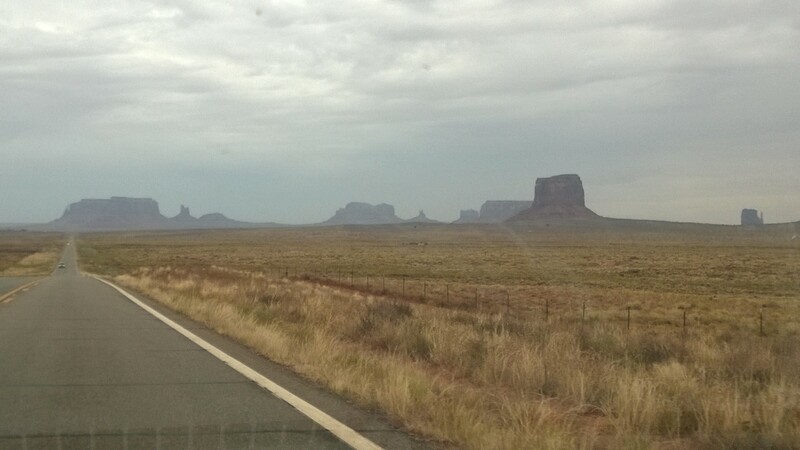 I wish I had stopped to take pictures, but I’m not sure photos could do it justice. This is an under-appreciated area and I encourage everyone to visit, if you can. I am impressed with their policy of cupless racing; they give you a hydra pouch to fill up along the way instead- brilliant! I hope more races go this way. The only problem we encountered was that the lead runners took a wrong turn early on in the race and we all ended up running an additional 1/2 mile. It reminded me of the Charleston Marathon in January! 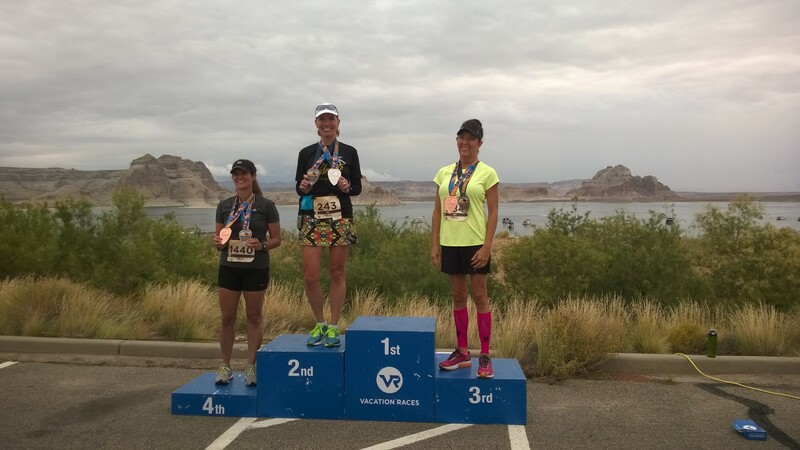 My time was good enough for a 2nd place age group win, and I got to stand on a podium for the first time! 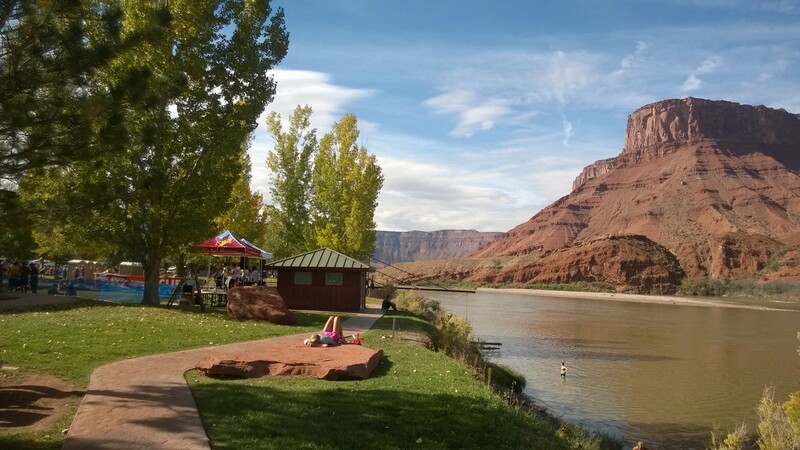 The Other Half is also an unbelievably gorgeous point to point course along the Colorado River. I did take this one a little easy and really enjoyed the race. We were all bused to the start for the 8:30 AM start. The finish line party was outstanding, with a great band, 3 beers and a pint glass for each participant, copious amounts of food and of course that gorgeous setting and perfect weather. I loved both of these races. If you need a lot of crowd support, they wouldn’t be for you, but there were plenty of aid stations at both races with volunteers cheering every couple of miles. The scenery more than makes up for lack of crowds. 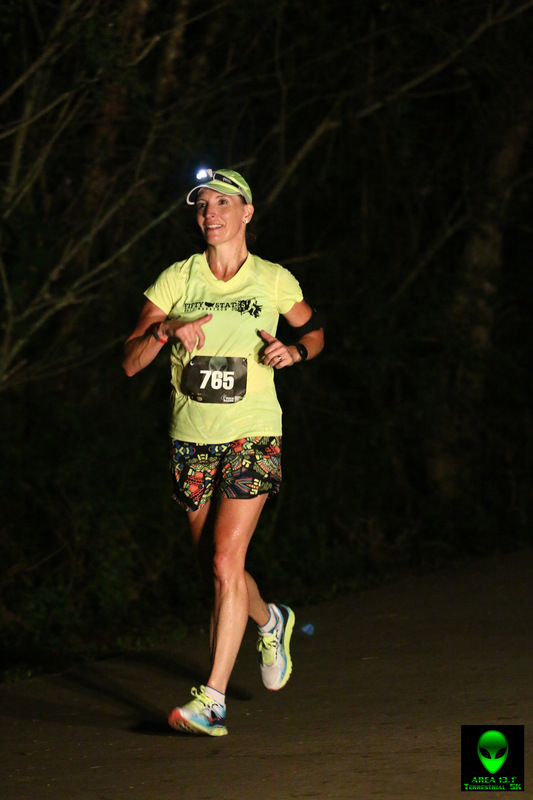 Each race had about 1000 runners, so there was plenty of companionship and camaraderie along the courses. Both of these races are in locations that are really vacation destinations and you really should spend some time to enjoy the areas. I’m already planning my return. 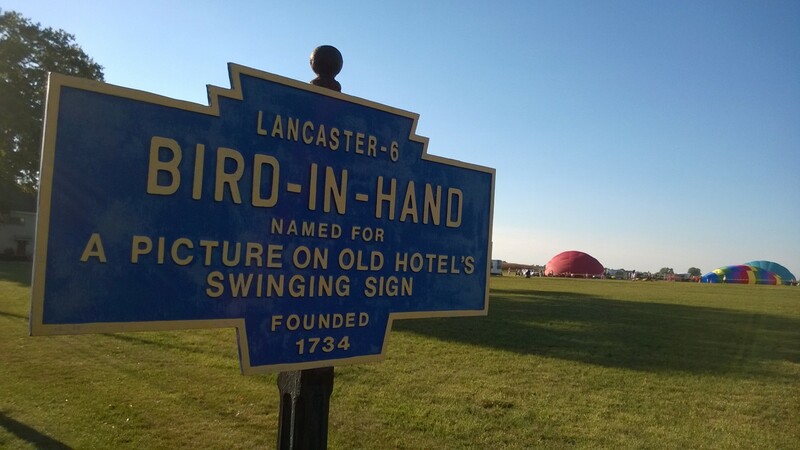 On Friday, my very sweet and supportive husband drove us up to the quaint little town of Bird in Hand, PA where I checked in for the Saturday morning half marathon. 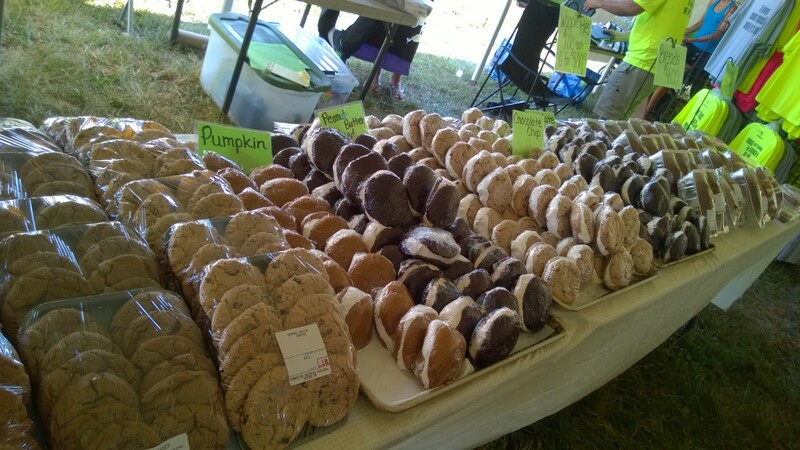 Even though I got a whoopie pie in my goodie bag, I had to stop by the bakery table and pick up some more. If you’ve never had a whoopie pie, you are really missing out! 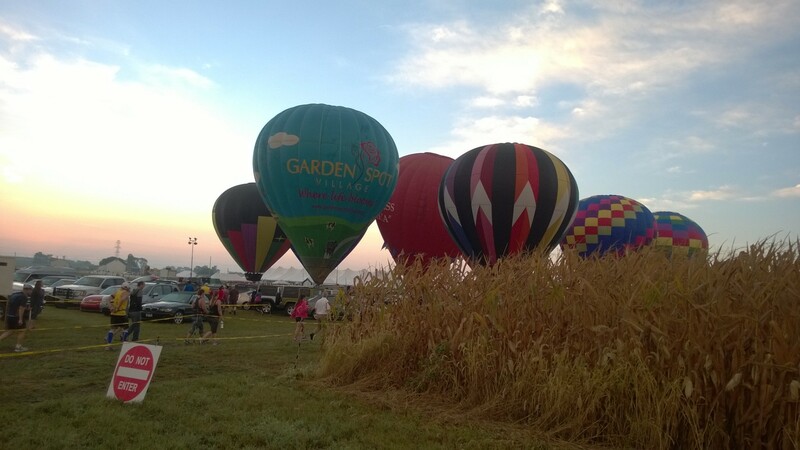 As I drove into the parking area for the race Saturday morning, I was greeted by a really cool sight, as the hot air balloons were getting set for a pre-race launch. So beautiful! 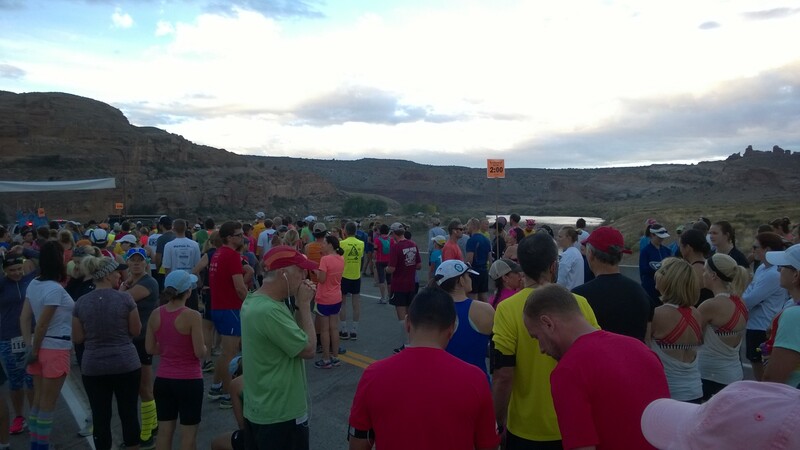 I met up with some fabulous Fifty Staters for a pre-race photo and then we lined up for the 7:30 AM start. The course itself is challenging but so picturesque. Rolling hills through beautiful farmland, and a small dirt road section around mile 10 (uphill, of course!) made this a tough race, but still oh so rewarding. The volunteer support was outstanding and the kids manning the aid stations were just precious! 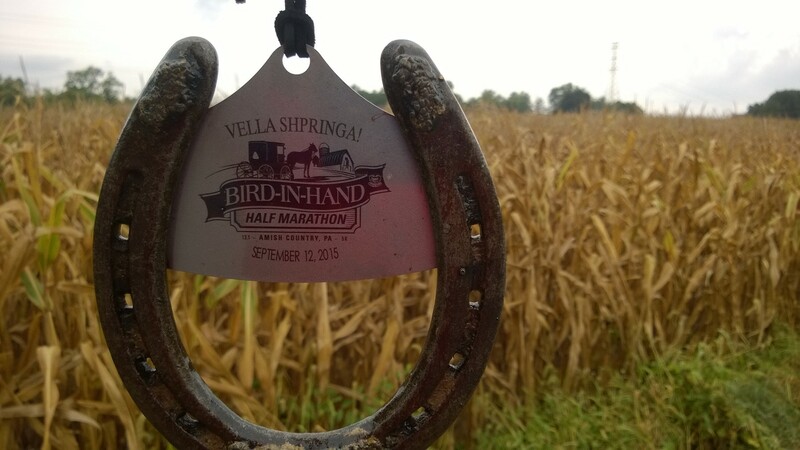 This is one well-earned medal and so unique- it’s a real horseshoe! I LOVED everything about this race and highly recommend it. It is very unique, run by locals and benefits the local fire department, extremely well-supported and everyone I met and talked to was just so NICE! It was a pleasure to run this race and we had a great weekend! 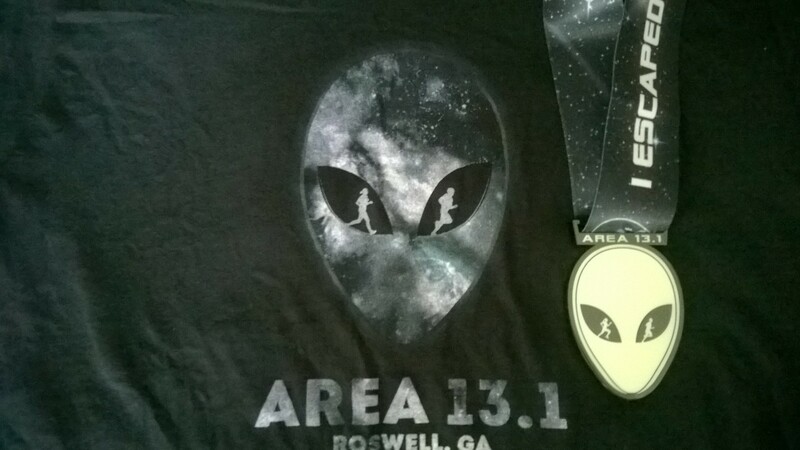 On Saturday, I drove to Atlanta to run the Alien 13.1 Half Marathon. Actually, I went to celebrate with my friend Ali, who was running her 100th half marathon. Can you even imagine what an accomplishment that is?!? I really wanted to be there to celebrate with her and other members of the 50 States Half Marathon Club. Here are some of us, just before the start. 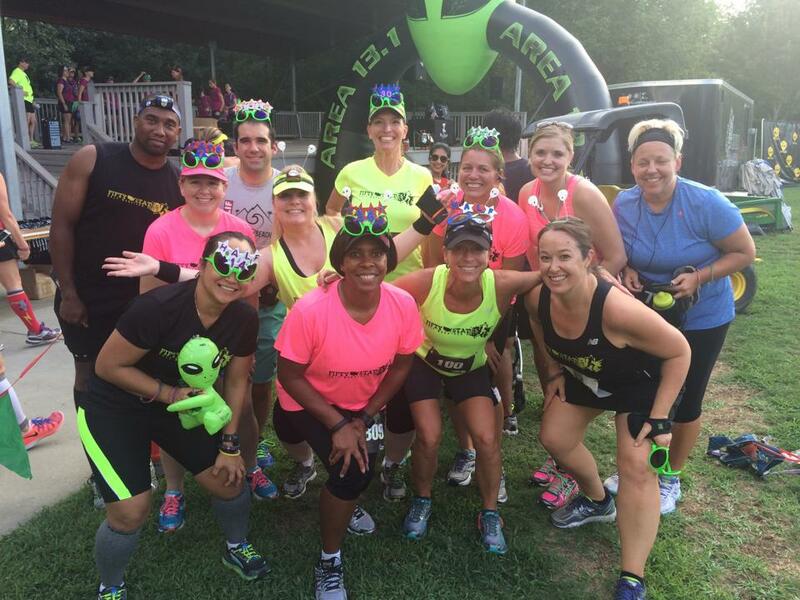 The Alien 13.1 was a night race, starting at 7 pm, and participants were encouraged to wear headlamps. I am very glad I heeded their advice because it did get really dark on the course. As you can imagine, being August in Georgia, it was also VERY hot and humid. I didn’t come with any personal race goals, other than to share the experience, which is a good thing. Despite the website’s claim to be a flat and fast PR course, I would definitely beg to differ. 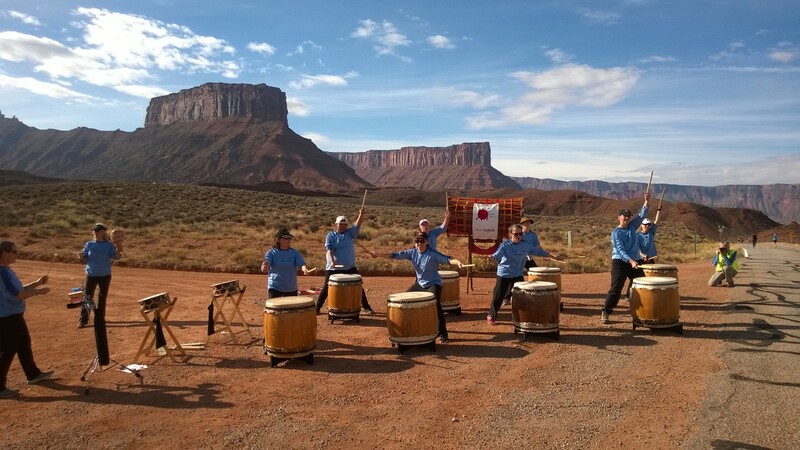 But… going into a race with no time expectations was a wonderful experience! Racing at night is also a different beast and, even though it was a tough one, I’m really glad I did it. They also provided free race photography, which is a thoughtful feature. 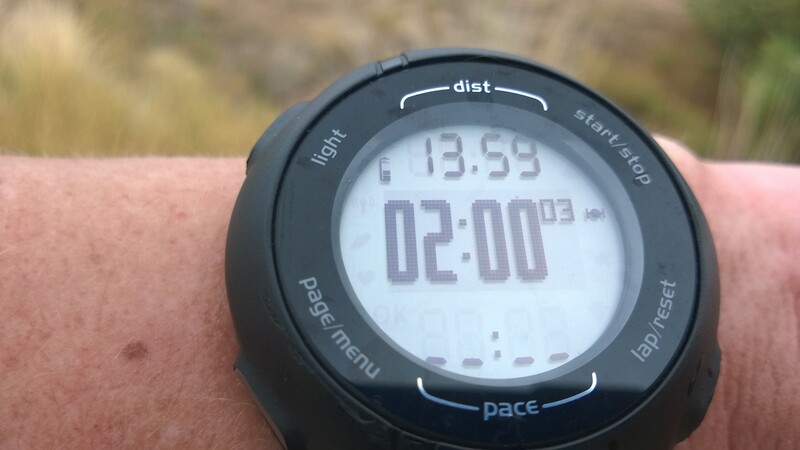 And for the record, this was half marathon #30 for me. Georgia was not a new state, so my state count remains at 18 done so far. I’ll be hammering out PA, NY, AZ, UT, AR, and OK in the next couple of months though. 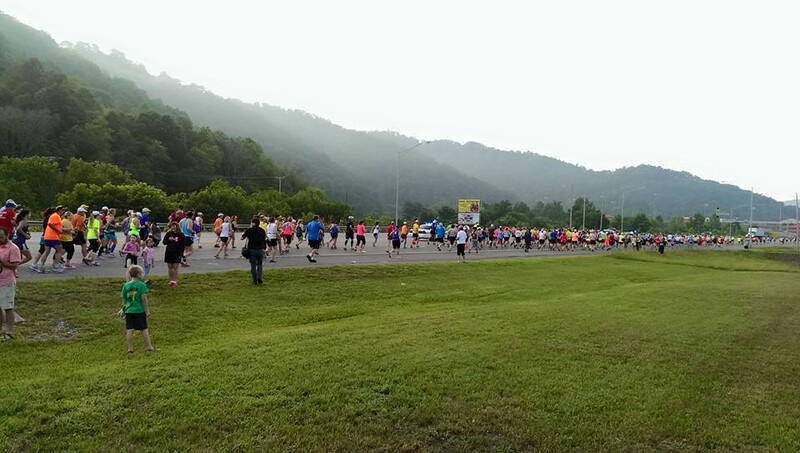 This past weekend, I drove to tiny Williamson, KY for the Hatfield-McCoy Blackberry Mountain Half Marathon. 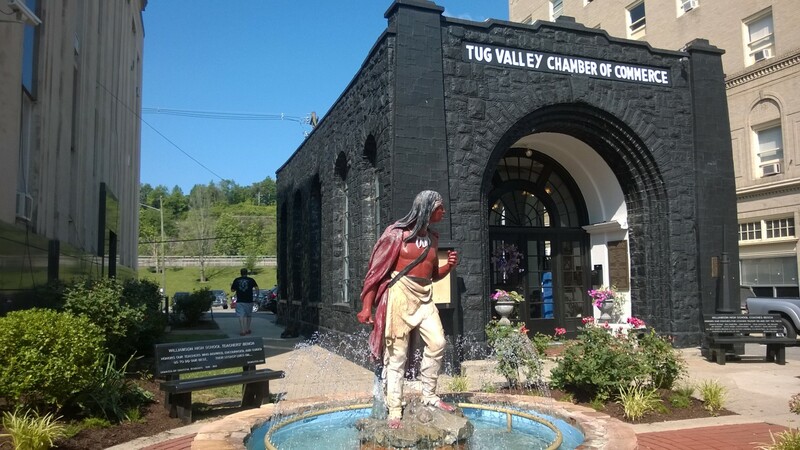 Because it ended in (even tinier) Matewan, WV, I was able to check off a new state, my 18th, and first new state since November. I chose to run the Blackberry Mountain first half. Runners had the option to run either the first or second half, or both, which they called “the double half”, or they could run the full marathon. 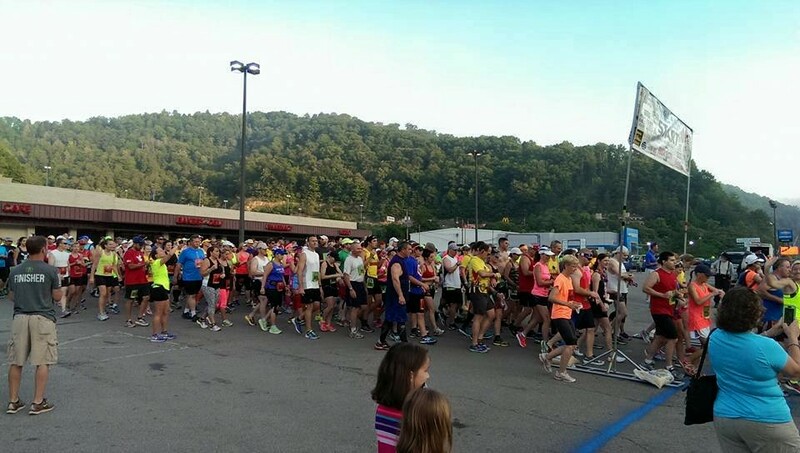 The first half and the marathon started together at 7 AM, while those choosing the run just the 2nd half were bused to Matewan, WV for an 8 AM start. There was a 10 AM start of the 2nd half for those doing “the double half”. A little confusing, I thought, but apparently an attractive option for those wanting “credit” for 2 half marathons in 2 different states. Since I didn’t really want to run a marathon this weekend (especially with a break of over an hour) or pay almost twice as much as the marathon cost, I stuck with a half marathon. 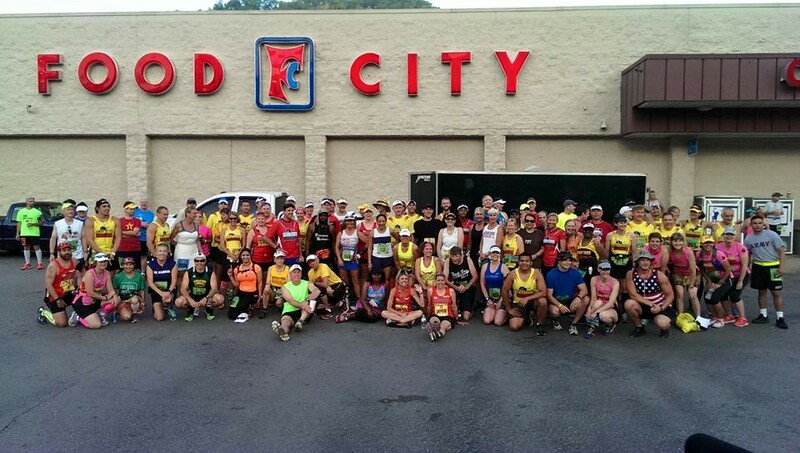 Here we are at the start, in the local Food City parking lot. Temps at the start were not too bad, in the low 70s, but it heated up during the day. Throw in some pretty significant hills (it IS called Blackberry mountain for a reason!) and some humidity, and this truly was a tough race. There is no time limit, however, and I think that attracted lots of people too. Still, it turned out to be smaller than I expected, with just 216 finishers in the first half, 283 in the 2nd half, and 345 in the full marathon. Running with a bunch of marathoners- and up a mountain!- I took it kind of easy, so I was shocked when a volunteer grabbed me as I crossed the finish line and told me that I was the 3rd Overall Female. 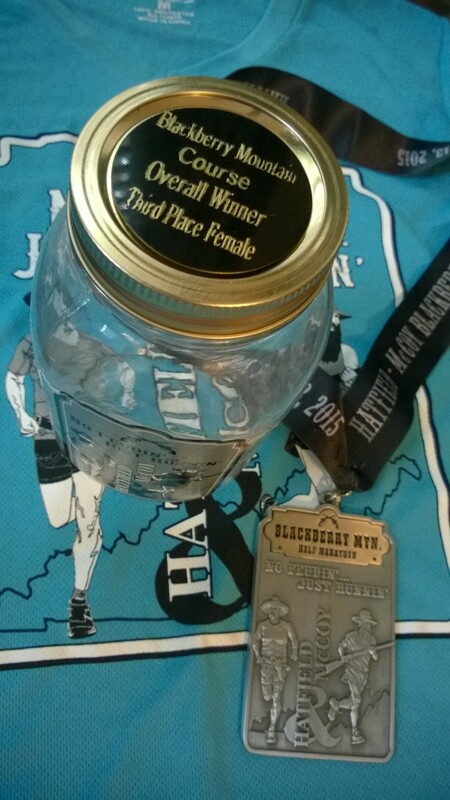 I truly thought she had made a mistake, but she handed me my award (and then another volunteer brought me watermelon and a drink, since I hadn’t gotten anything yet), then the 2nd place female and I, along with a few other finishers hanging around, had a little celebration, since there was not an actual awards ceremony. … a little history lesson too! 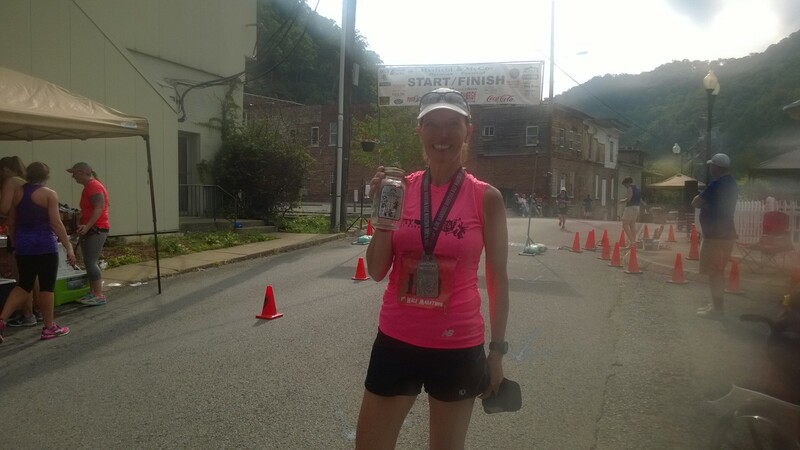 Here’s one more photo from Williamson, WV, near the full marathon finish line. This is the historic Coal House. 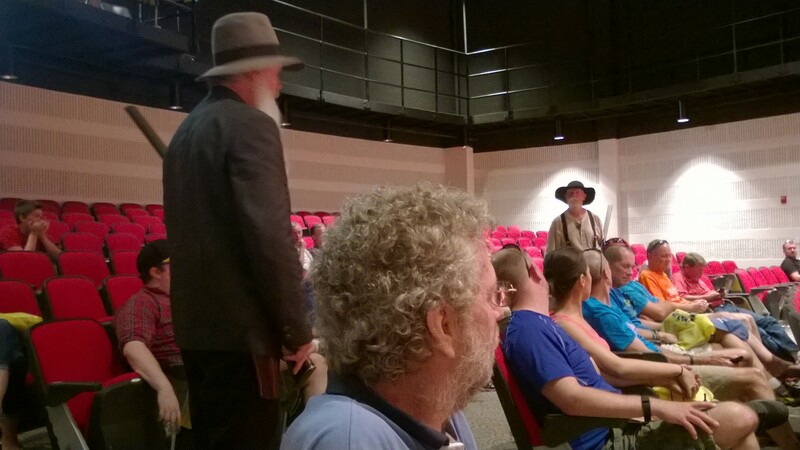 This is coal country, folks!